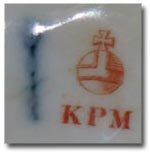 The KPM and Sceptre Marks of the Berlin Porcelain Company. Berlin Porcelain Marks including the well known Berlin Sceptre Mark & significant dates in the history of Berlin Porcelain. 1751 to 1757 — while Wegely owned Berlin porcelain products were marked with the initial ‘W’ in blue under glaze. 1761 to 1763 — while Gotzkowsky was in command, Berlin porcelain was marked with the initial ‘G’ in blue under glaze. 1763 to 1837 — Berlin porcelain was marked with the sceptre mark in blue under glaze. The Berlin sceptre mark was introduced when Frederick the Great bought the factory. In this period the sceptre was shown with a horizontal bar. 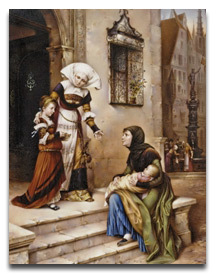 From the 19th century, in addition to the Berlin factory mark, pieces decorated by painters employed by the Berlin factory had a decoration mark applied. This was stamped in blue, red or green on the glaze and depicted a sceptre, an eagle or a globe. 1837 to 1844 — the initials ‘KPM’ were added to the Berlin sceptre mark (KPM stands for Königliche Porzellan Manufaktur’). Berlin Porcelain Marks used by the factory after the re-opening by Gotzkowsky in 1761. 1844 to 1847 — the sceptre in the above mark was replaced by an eagle holding a sceptre and a globe. Be aware of objects offered with this type of mark as it was recently used by an unknown factory producing porcelain which is poorly modelled and badly decorated. From 1870 — the Berlin Sceptre mark was re-introduced, but with a diagonal bar instead of the earlier horizontal one. 1882 to 1918 — a special type of porcelain was developed by Seger; and wares made using this porcelain were marked with the Berlin sceptre mark and the initials ‘S.gr.P’ (Seger-porzellan). At the end of the second world war the berlin porcelain factory was partly destroyed. During the rebuilding production was moved temporarily to a factory located in Selb. Berlin porcelain produced during this period is marked with the sceptre mark and the initial ‘S’. Often alongside the Berlin Sceptre mark there is an imperial Orb. The Orb colour usually defines the type of decoration on a piece of KPM or Berlin Porcelain. A red Imperial Orb is used to indicate the decoration includes floral painting, figurative scenes and landscapes. A green Imperial Orb is added to all pieces that do not have floral decoration. A blue Imperial Orb is stamped on porcelain that is classed Grand Feu, when colours are fired at very high temperatures and fuse with the glaze. A black Imperial Orb appears on branded porcelain that includes company logos, etc. Demonstrating the difficulty in establishing exactly which mark it is. Very close inspection is required due to the sometimes faint application of the mark.